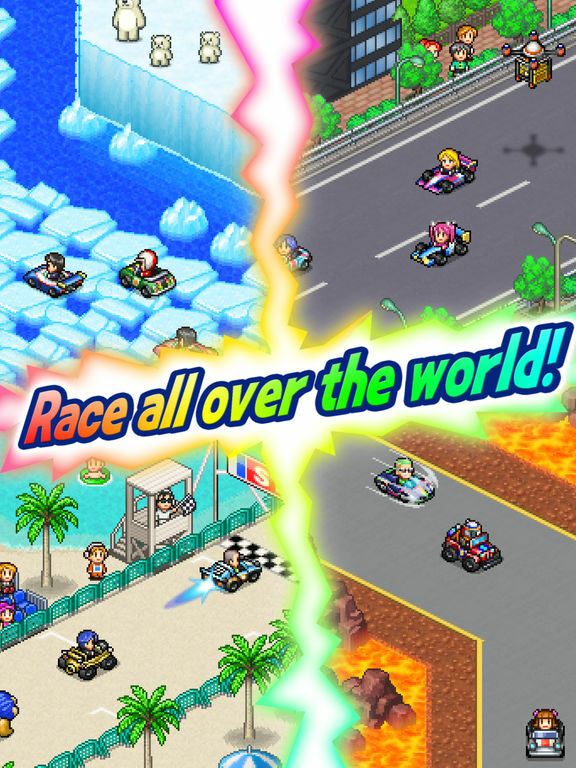 Grand Prix Story 2 is yet another entry in Kairosoft's extensive library of accessible and adorable sim games. This time it's a sequel to their game about managing a race team, and it itself also about managing a race team. Go figure. So you want to be a big time racer? The team is more important than the car. Try to fill your team with good people, as their talents will allow you to build even better cars right from the start. And, of course, better drivers can make up for a less than perfect ride. Stats are more important than levels. Someone's level doesn't really amount to much, honestly. When hiring new staff, look at their stats and things like their Form and Growth potential instead. Those are the bits that matter. Train everyone when you can. It takes money, but you can train any of your staff in things like Strength, Agility, Tech, and so on. The higher the numbers, the better everything from car construction to race performance will be. Upgrade everything. You can use special items to improve the level of your cars, which in turn improves their performance. You can also upgrade your buildings to have them generate more resources, store more resources, etc. These are always good things. Pay attention to track conditions. When selecting a race, you'll see an icon underneath the image of the track map that indicates whether you'll be primarily on normal roads, icy roads, go off-road, and so on. Similarly, different vehicle types have different specialties when it comes to track surfaces. Try to use a car that's better suited for the rod conditions when you can. I've been enjoying Grand Prix Story 2 quite a bit, but I also took a bit of a break from Kairosoft games for a little while so I haven't felt any sort of burn out on the formula yet. Your milage may vary (har-har) but I think it's safe to say that if you're not sick of the developer's distinct style yet you should consider giving it a try. Game Dev Story was about as much of a time sink for me as it was for most mobile users when it first released, and has led to me being a fairly faithful Kairosoft fan since. Mostly. That said I did take a break when a lot of their games started to feel exactly the same, just with a different theme (I'm looking at you, Dungeon Village and Epic Astro Story). So for all I know, Grand Prix Story 2 might be more of the same thing that everyone else is burned out on - but from my 'took a break for a little while' perspective it's pretty entertaining Kairosoft goodness that doesn't feel like a simple rehash. As expected, you're put in charge of a fledgling race team with lofty goals and boundless enthusiasm. You get to build cars for racing, upgrade your vehicles, train your drivers and engineers, research new technologies, construct buildings around your garage to produce resources like fuel and money, etc. And you get to race, of course. 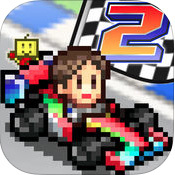 Grand Prix Story 2 is a pretty good example of what Kairosoft does well: take a complicated idea for a simulation and scrape away at the meticulous bits until left with something that's streamlined and accessible while also still offering plenty of minutiae to tweak. In other words they turn what could be boring and tedious into something far more enjoyable - most of the time. It worked again this time, at least. Until one of the resource wells runs dry, there's usually something to do that will keep you playing longer than your average freemium sim. You can peruse the shops, start building stuff, upgrade cars, research new technologies, salvage unwanted vehicles for research points, hire new staff, compete in regular races, race against rival players, or join a multi-race grand prix. Racing does require fuel, as well as reduce the durability of the car that's used, but it takes a long time to burn through my fuel with just two standard fuel tanks (pre-upgrading, no less) and having more than one car allows you to switch up if one starts to get too beat up. Plus your team will fix the cars automatically over time. Aside from things being relatively non-restrictive for a free game (I've yet to run out of fuel with two refineries, and earning money is a simple matter of repeating a race or two), what I really appreciate about this one is how just about everything you can do counts as progress. Building new structures is always helpful in some way. Training team members is an obvious boon. It's pretty easy to earn or buy materials to upgrade cars. Heck, racing by itself has like three (four if you count the random drones you can tap to earn premium currency) forms of progress: making fans happy to earn free stuff, leveling-up team members, and earning money from the race. Of course, Grand Prix Story 2 is a free game, and as such it has a couple of issues with progress slowing down suddenly. Car repair is one potential issue, with durability taking a fairly long while to get back up to 100% on a given vehicle. Of course this is far less of an issue if you have more than one car, but it's still a thing to watch out for. A more bizarre (and more troublesome) issue I've run into is the process of constructing new buildings. I'm fine with the work taking time, and being limited in how many construction projects can be going at once, but you have to buy buildings from the shop before you build them. By which I mean you have to spend in-game money to buy them, then spend even more in-game money to actually build them. This is absurd not just because you have to spend money on a project twice, but because it's a clunky way to set up the process in general. You have to buy it in one menu, then exit and go into another menu to build it (and spend more money). Who thought this was a good idea? Like I said, I've taken a break from Kairosoft games for a bit so it's possible that those who have been keeping up might feel a bit burned out on the whole thing once they get to Grand Prix Story 2. 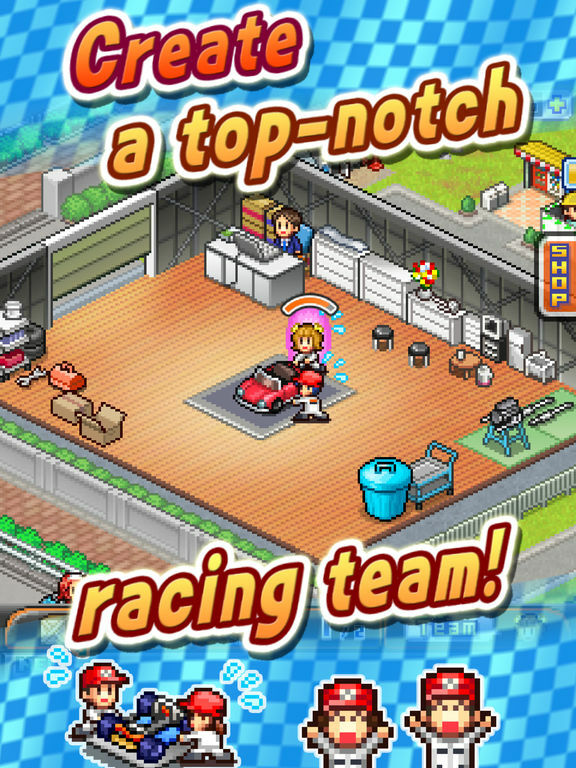 However, I think if you haven't hit your limit yet, or if you aren't that familiar with Kairosoft and are interested in an entertaining racing sim, then you absolutely should give it a try.